Come back tomorrow to hear how we like "podding"! Whaaaat.....you're making us wait LONGER??? Just Kidding! SO excited to hear all about it! 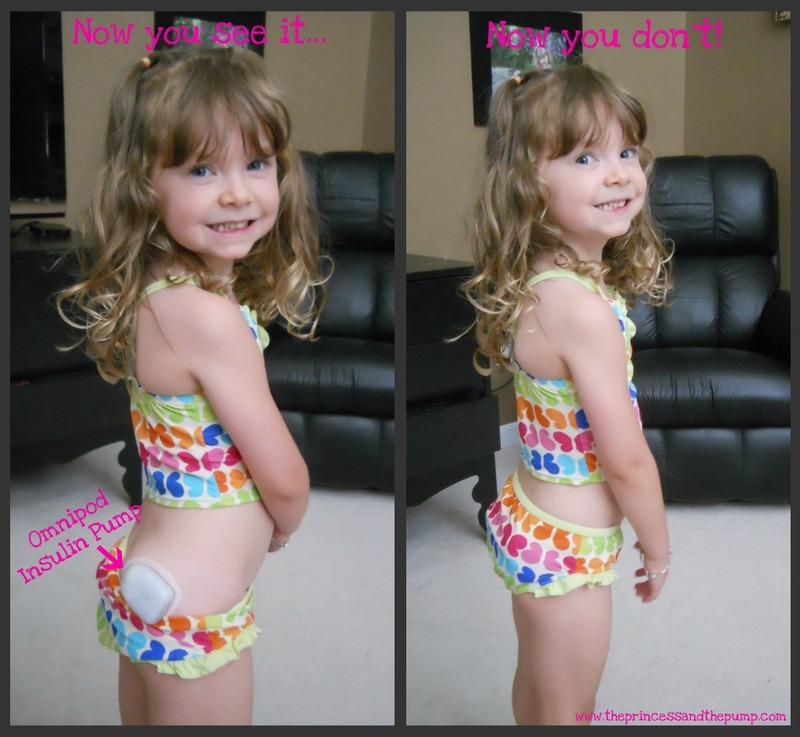 She looks ADoRBS with her pod! Hallie, I might be biased, but I think it looks good on her. :) One thing I love about the OmniPod is all the checks it runs on itself to make sure it is functioning correctly. And I remind myself of that every time we get one that starts to beeeeeep. Reassurance. Hope the transition goes smoothly for you guys! Love the pics! So excited for you. Sorry it had to take a bad situation to bring a new possibility, but that smile is priceless! Big smiles! She does look adorable with her pod...but, heck...she is ADORABLE.ALL.THE.TIME! if the new insurance will cover it that is the one I want for Joshua I think!! Cant wait to hear more! The OmniPod was my first-ever pump, and I loved it. Ultimately, I had some site absorption issues and skin sensitivity issues, so I had to move to a traditional pump. My advice to you is to rotate the Pod so that the same (large) area of skin it covers is not covered for more than 2 days in a row. Of course, your daughter is small, so she doesn't have a lot of sites for infusion of insulin anyway. Also, Insulet's customer support is wonderful. You'll have defective Pods from time to time, but they will replace them. I doubt you'll EVER have the Pods giving TOO much insulin, so hypoglycemia is not going to be related to Pods overinsulinizing. Underinsulinizing is more of an issue in some people, so just keep the Dex going, or test, test, test! Good luck. The food database is wonderful! Hope she's loving it. We started using the omnipod the middle of June. It was our first pump. Ms. Lorraine Out Of The Loop Sisto here. This is exciting news! Looking forward to catching up and hearing more! I am a bit surprised! But so happy for you all, I hope you all love podding as much as we do! Lily is looking forward to seeing Avery at Camp ko man she, (she will be a camper) Good luck to you all! What a big girl! That is the cutest pumper on the planet. I hope that she loves it and doesn't miss shots. I've been podding since July 1st, so I've got a whopping 12 days under my belt (pod?). But I love it! I have no other pumps to compare it to, since I've been doing MDI for 19 years since dx, but I do love it. YOu'll have to play around with bolusing or increasing basal around pod change time, but there's a ton of info out there, and obviously lots of the DOC people have pods and advice. Good luck, can't wait to hear how you like it! I've had you on my mind lately. Praying this is the fix you needed and you feel comfortable with the customer service/reps! Hope it's going well so far...looking forward to hearing all about it. Woo-To-The-Hoo!!!!!! We will be joining the pod club in a couple of weeks. So excited for you guys! Love the before and after, too. And might I add, she's so stinking cute!! I can't wait to hear more about it! She looks adorable of course! How CUTE is SWeets?? : ) Love that little swimsuit! So happy for you guys, Happy Podding! : ) Glad you found one you like, let us know how it goes! : ) Hugs! !